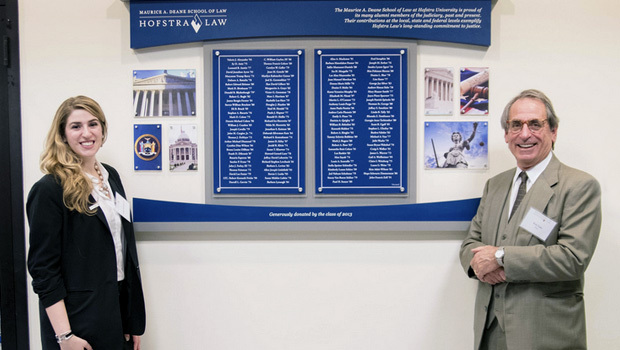 Forty-five of Hofstra Law’s more than 125 active and retired alumni members of the judiciary gathered on Nov. 19, 2014, in the Law School’s Leeds Morelli & Brown Atrium for the unveiling of the Judges Wall, a gift of the Class of 2013. Hofstra Law has a long tradition of alumni entering the judiciary, beginning with its first class. Hon. John Farley ’73, the very first student enrolled at Hofstra Law, was named by President George H.W. Bush in 1989 as a judge for the U.S. Court of Veterans Appeals. On the international level, alumnus Hon. Neal Hendel ’76 was named in 2009 as a justice of the Israeli Supreme Court, where he continues to serve. To ensure the accuracy of the Judges Wall, the Law School would like to develop a historical record of our alumni judges’ service. Alumni judges can visit law.hofstra.edu/Judges to submit correct and updated information. View photos from the Judges Wall event.